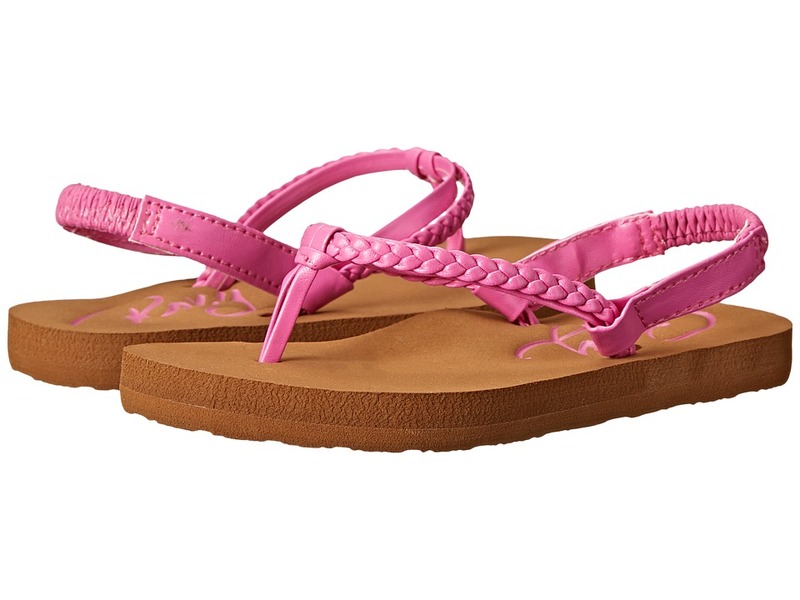 Enjoy the sand with the beachgoing fun of the Roxy Vista sandal! EVA upper is water friendly. Faux nubuck toe post. Polyester lining. Woven ROXY logo flag label. 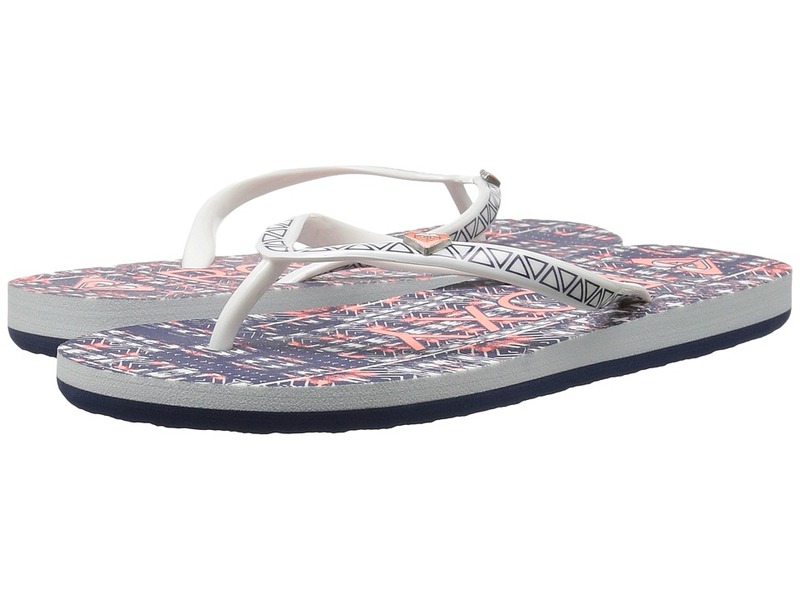 Soft EVA insole with graphic print. Durable rubber outsole for all-day play. Imported. Measurements: Weight: 7 oz Product measurements were taken using size 2 Little Kid, width M. Please note that measurements may vary by size. Weight of footwear is based on a single item, not a pair. Take your tiny tot to the beach with the Roxy Kids Tahiti VI! Soft two tone rubber upper. Dual density EVA footbed adds comfort for all-day play. Back strap allows for a secure wear. EVA outsole for comfort flexibility. Imported. Measurements: Weight: 1 oz Product measurements were taken using size 5 Toddler, width M. Please note that measurements may vary by size. Weight of footwear is based on a single item, not a pair. 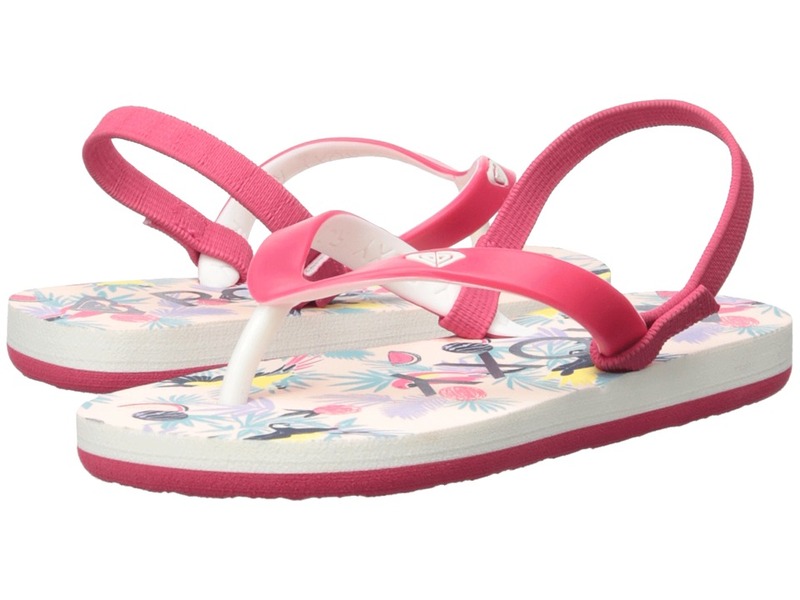 Whether she~s by the beach, at the park, or playing at home, fit her feet into the Fifi II sandal by Roxy Kids! Water-friendly synthetic upper with soft poly-web lining. Speckled rubber strap with a finishing bow. Soft elastic back strap for a snug fit. Active Foam footbed with arch support for added comfort. Printed graphic on footbed. EVA outsole provides grip. Imported. Measurements: Weight: 3 oz Product measurements were taken using size 5 Toddler, width M. Please note that measurements may vary by size. Weight of footwear is based on a single item, not a pair. 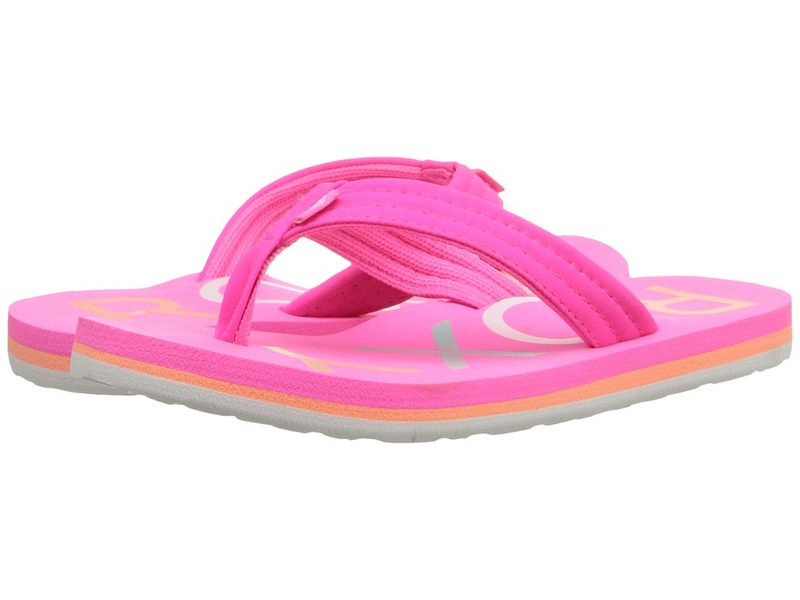 Set your sights on the Roxy Kids Vista II for an easy-going, comfortable sandal! EVA upper is water friendly. Faux nubuck toe post with polyester web inside. Adjustable back strap for younger sizes. Polyester lining for a comfortable wear against foot. Woven ROXY logo flag label. Soft EVA insole with graphic print. Durable rubber outsole for all-day play. Imported. Measurements: Weight: 1 oz Product measurements were taken using size 9 Toddler, width M. Please note that measurements may vary by size. Weight of footwear is based on a single item, not a pair. 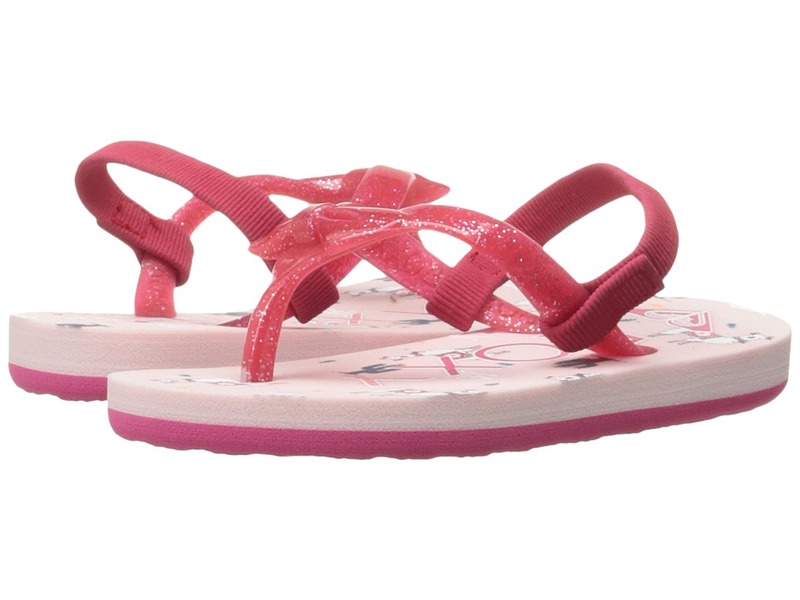 Whether she~s by the beach, at the park, or playing at home, fit her feet into the Fifi II sandal by Roxy Kids! Water-friendly synthetic upper with soft poly-web lining. Speckled rubber strap with a finishing bow. Soft elastic back strap for a snug fit. Active Foam footbed with arch support for added comfort. Printed graphic on footbed. EVA outsole provides grip. Imported. Measurements: Weight: 2 oz Product measurements were taken using size 9 Toddler, width M. Please note that measurements may vary by size. Weight of footwear is based on a single item, not a pair. 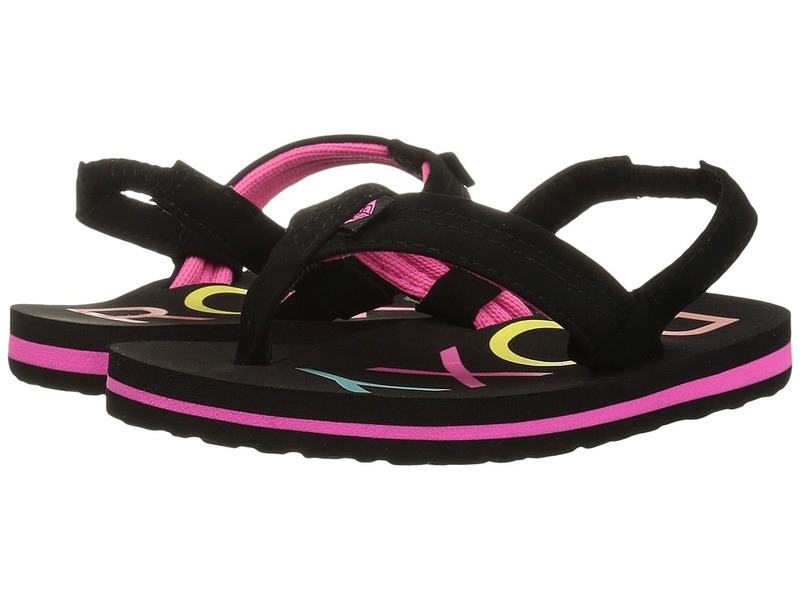 The Roxy Kids Pebbles VI is a fun, colorful sandal for her to relax and play in! PVC upper with print detailing. Soft elastic back strap to hold feet in. 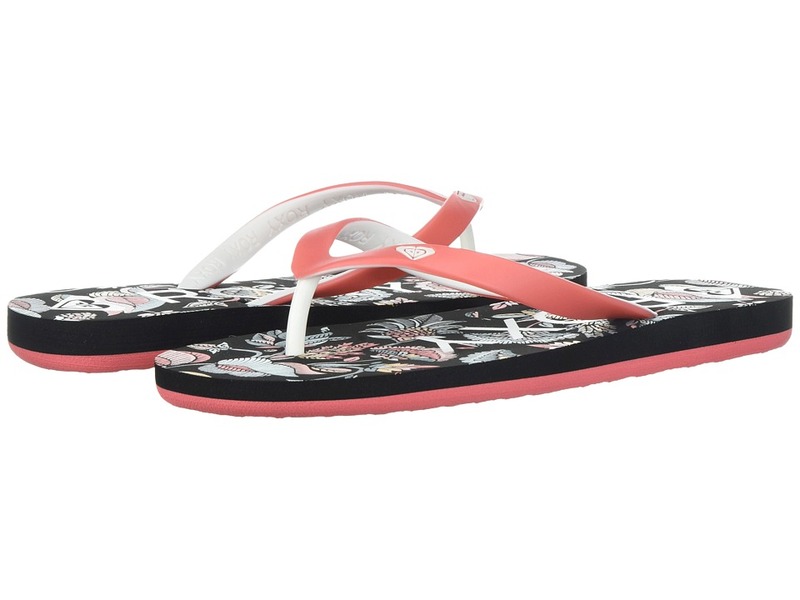 Dual density EVA footbed with fun prints for added design. 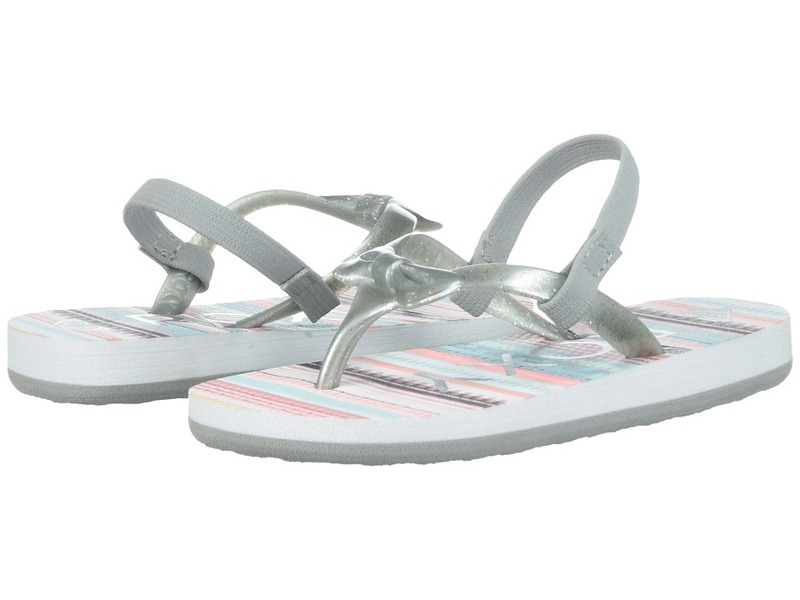 EVA outsole for wear on the beach or at home. Imported. Measurements: Weight: 2 oz Product measurements were taken using size 9 Toddler, width M. Please note that measurements may vary by size. Weight of footwear is based on a single item, not a pair. 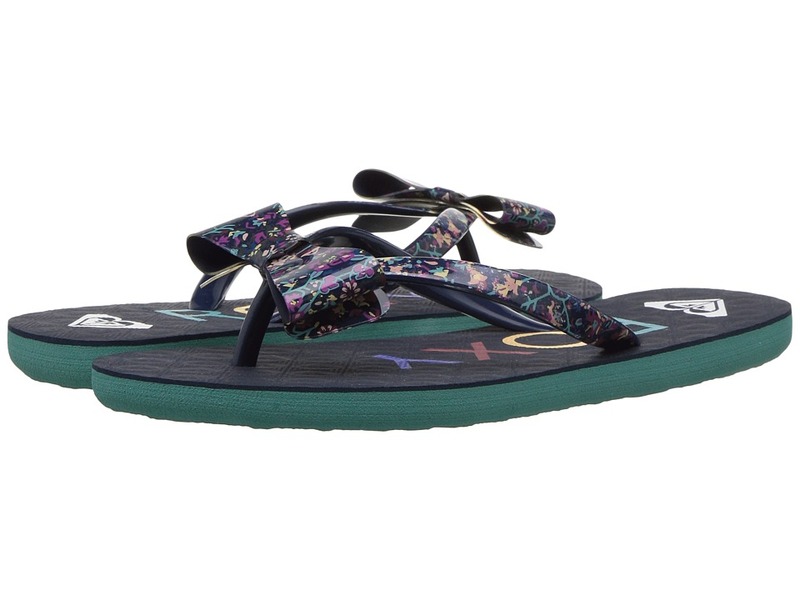 Take your tiny tot to the beach with the Roxy Kids Tahiti VI! Soft two tone rubber upper. Dual density EVA footbed adds comfort for all-day play. Back strap allows for a secure wear. EVA outsole for comfort flexibility. Imported. Measurements: Weight: 2 oz Product measurements were taken using size 9 Toddler, width M. Please note that measurements may vary by size. Weight of footwear is based on a single item, not a pair. 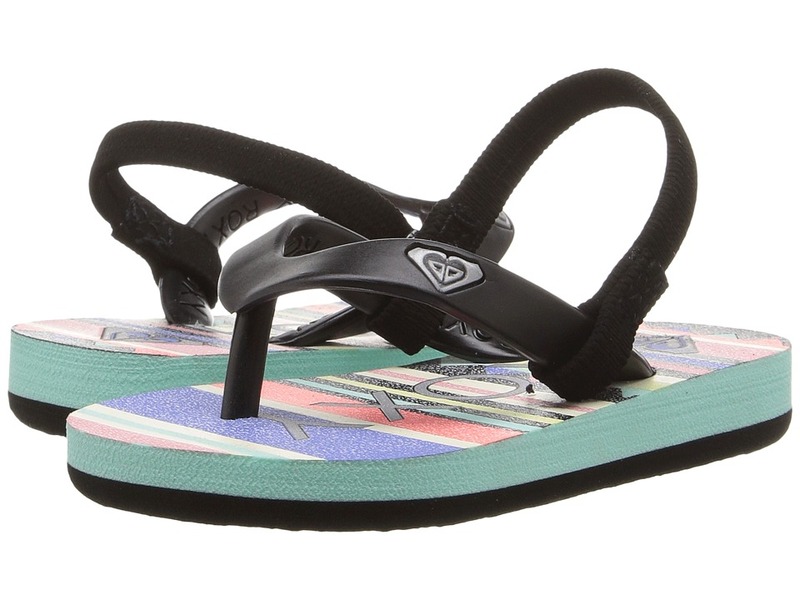 Live a little with the easy and colorful wear of the Roxy Kids RG Lido IV! Colorful canvas upper. Slip-on construction with side elastic goring. Fabric lining for a good wear in shoe. Cushioned footbed provides comfort for all-day play. Textured rubber outsole. Imported. Measurements: Weight: 6 oz Product measurements were taken using size 2 Little Kid, width M. Please note that measurements may vary by size. Weight of footwear is based on a single item, not a pair. 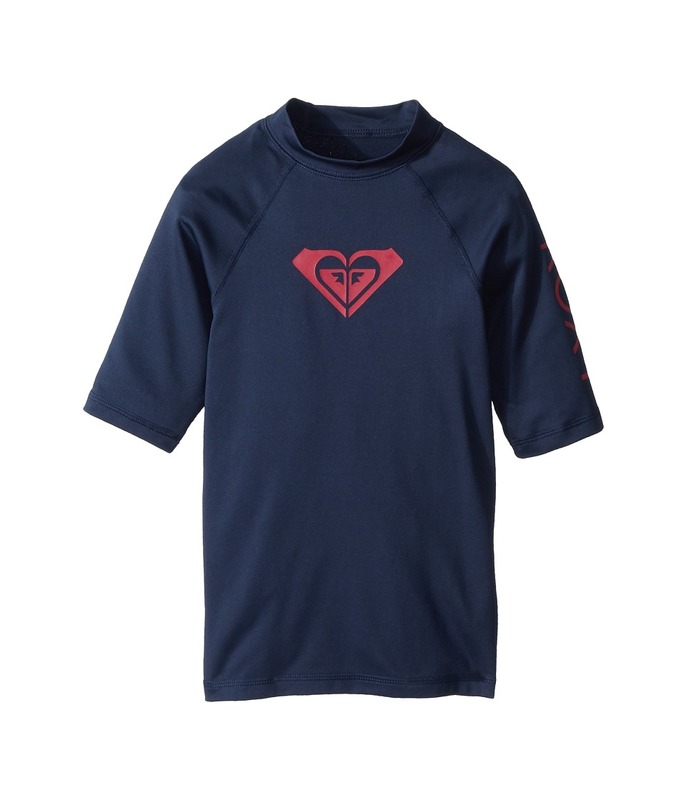 Give it your all while you are out in the waves with the Whole Hearted Short Sleeve Rashguard! Fitted top features stretch fabrication for a wide range of motion and brand design at center front and left sleeve. High round neckline. Half sleeves. Straight hemline. 92 percent polyester, 8 percent elastane. Hand wash, dry flat. Imported. Measurements: Length: 22 1 2 in Product measurements were taken using size XL (14 Big Kids). Please note that measurements may vary by size. If you~re not fully satisfied with your purchase, you are welcome to return any unworn and unwashed items with tags intact and original packaging included. 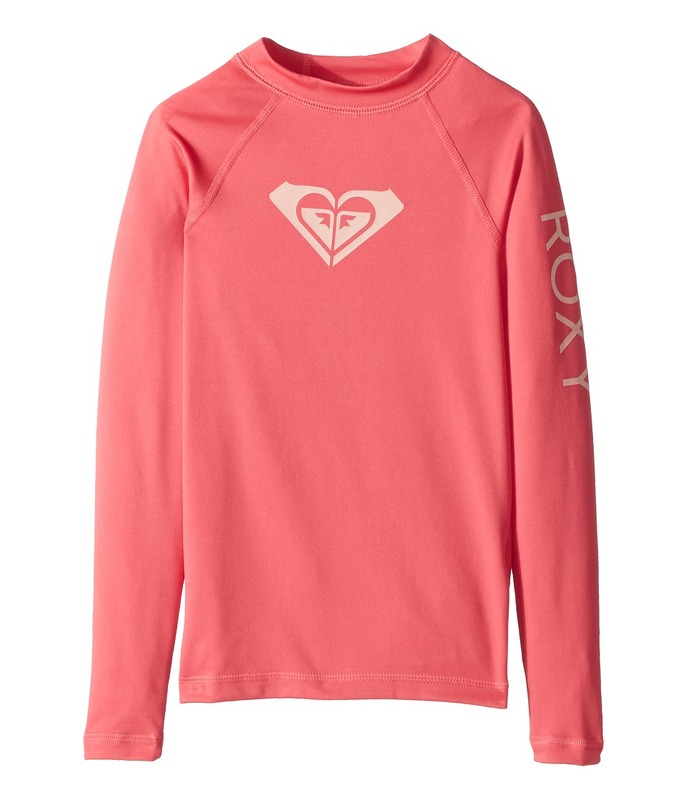 Hit the waves and give it your all in the Whole Hearted Long Sleeve Rashguard! Fitted top features stretch fabrication for a wide range of motion and brand design at center front and left sleeve. High round neckline. Long raglan sleeves. Straight hemline. 92 percent polyester, 8 percent elastane. Machine wash, tumble dry. Imported. Measurements: Length: 19 in Product measurements were taken using size SM (8 Big Kids). Please note that measurements may vary by size. If you~re not fully satisfied with your purchase, you are welcome to return any unworn and unwashed items with tags intact and original packaging included. 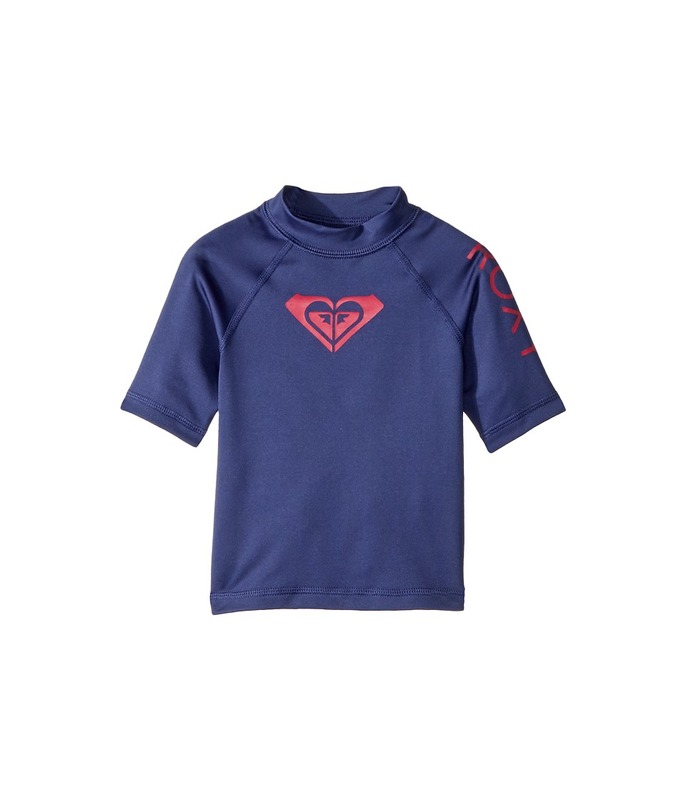 Give your all to the surf scene with the Whole Hearted Rashguard on your back. Pullover rashguard tee in a fitted silhouette. Rashguard fabric: &amp#8226 Lightweight poly knit protects against spills and sun. &amp#8226 Stretch blend improves range of motion. &amp#8226 UPF 50 fabrication protects your skin during outdoor activity by blocking harmful Ultraviolet A and Ultraviolet B rays (UVA and UVB). &amp#8226 6 oz/yd&amp#178 fabric weight. Flatlock stitching flexes to increase mobility. Mock neck. Short raglan sleeves. Straight hemline. Logo print at the chest and left sleeve. 92 percent polyester, 8 percent elastane. Machine wash and tumble dry. Imported. Measurements: Length: 15 1 2 in Product measurements were taken using size 5 Little Kids. Please note that measurements may vary by size. If you~re not fully satisfied with your purchase, you are welcome to return any unworn and unwashed items with tags intact and original packaging included. 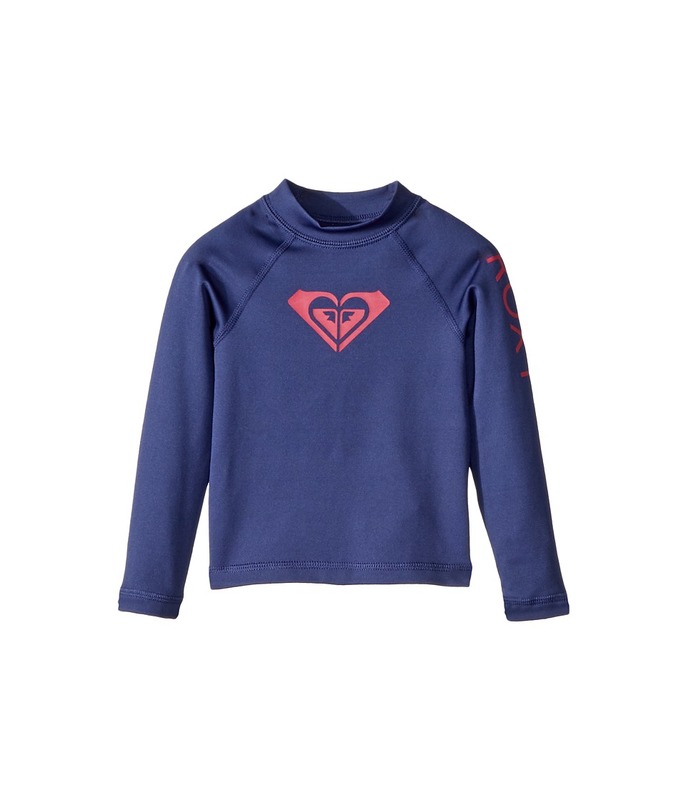 Give it your all while you are hitting the waves in style with the Whole Hearted Long Sleeve Rashguard! Fitted top features stretch fabrication for a wide range of motion and brand design at center front and left sleeve. High round neckline. Long raglan sleeves. Straight hemline. 92 percent polyester, 8 percent elastane. Machine wash, tumble dry. Imported. Measurements: Length: 17 in Product measurements were taken using size 7 Big Kids. Please note that measurements may vary by size. If you~re not fully satisfied with your purchase, you are welcome to return any unworn and unwashed items with tags intact and original packaging included. 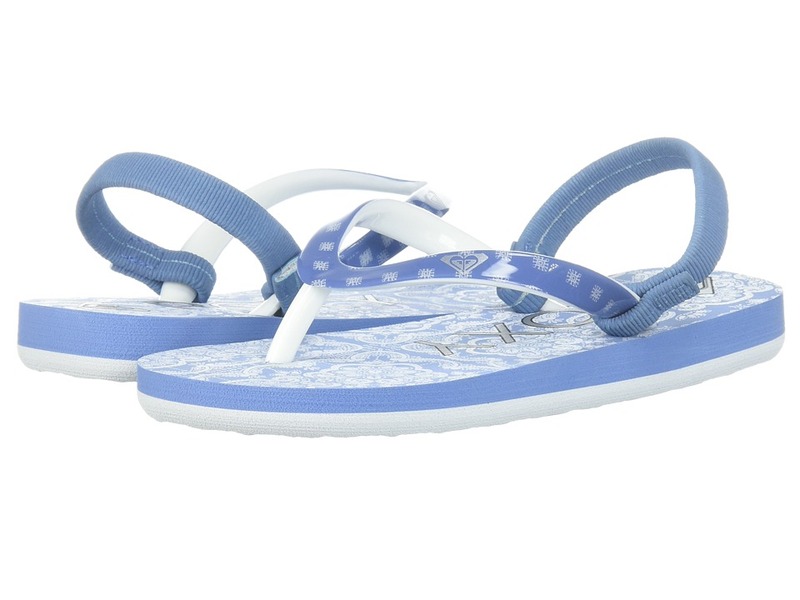 Bring chill style to the schoolyard with the versatile Roxy Kids Bayshore II shoe! Low-top silhouette. Textile uppers with printed heel detailing. Lace-up closure. Memory foam padded insole with graphic print. Flexible TPR-injected outsole with molded arch detailing. Imported. Measurements: Weight: 6.4 oz Product measurements were taken using size 4 Big Kid, width M. Please note that measurements may vary by size. Weight of footwear is based on a single item, not a pair.